Dogs are born with strong natural instincts, including barking, digging and being totally lovable to humans. Some people also think that swimming is a skill that all dogs naturally have. 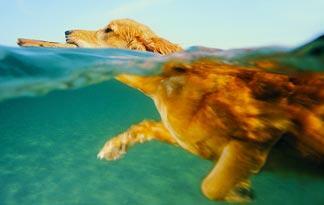 Why would they call it the "doggie paddle" unless it was something all canines could do? But swimming isn't necessarily an innate ability for dogs. While many pooches are perfectly amphibious, many of man's best friends tend to sink like a sack of bricks when submerged. For these dogs, keeping their heads above water is about as easy as keeping their noses away from other dog's rear ends. In other words, it's pretty much impossible. When it comes to swimming, canines generally fall into one of three categories. There are those that can swim, those that can be taught to swim and those that should steer clear of all aqueous environments. Water spaniels, golden retrievers, Irish setters, English setters, and the water-loving Newfoundland fall into the first category -- all excellent swimmers. This is mainly because of their strong limbs, but this ability may also be in their genes. Many were bred specifically to retrieve waterfowl or for water rescue. Each of these dogs has a strong tradition of swimming within the breed and generally enjoys being in water. At the other end of the spectrum are the low and lovable sturdy breeds like bulldogs, dachshunds and boxers. There simply isn't enough thrust from their short legs to keep them afloat in aquatic environments. Breeds that have short faces, such as the pug, also have a very hard time swimming since they fatigue easily. Small dogs such as the Maltese and Chihuahua are sometimes good swimmers, but may become easily chilled or frightened in the water, which can increase the risk of drowning. Some dogs may have the physical capacity to swim, but have a mortal fear of the water nonetheless. These animals tend to panic when submerged. For a dog in water, panic quickly leads to fatigue, which makes drowning much more likely. That spells bad news for you and your pet. When a dog is frightened in the water, he will attempt to climb on top of you, kicking and scratching until you manage to get to land (if you're teaching your dog to swim, bring a pup-appropriate life preserver). An animal's individual temperament is also an important factor in whether he can swim. Some dogs don't even like to go out in the rain, let alone go swimming. And if your dog isn't a canine version of Michael Phelps, don't despair. You can still enjoy water fun with a land-loving lapdog. Assuming your pet actually enjoys being submerged, there are many different life vests and jackets that can keep your pooch safe and sound in the pool or pond. And for those who prefer to remain dry, there is always a doggie day bed for a snooze at the water's edge.